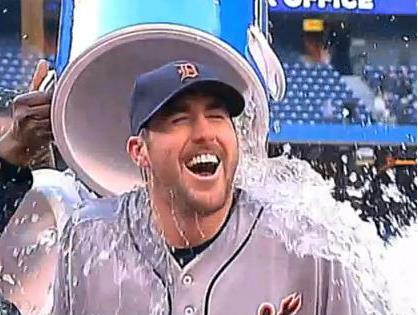 Justin Verlander, enjoying the fruits of his accomplishment. Last week we heard about the superstitious behavior of the Twins as Francisco Liriano worked through his no-hitter against the White Sox. This week: An additional spate of such behavior as pitchers around the league flirted with their own no-no’s—and in the case of Justin Verlander, actually completed it. 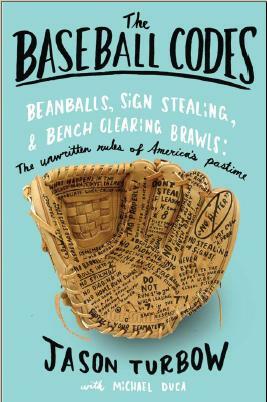 A primary piece of no-hitter etiquette has to do with avoiding the pitcher in any way possible and under no circumstances mentioning the fact of the no-hitter. This happened during Liriano’s feat, but not in Verlander’s—at least as far as the pitcher was concerned. In Toronto, Verlander’s teammate, Alex Avila, took things a step further, refraining from using the restroom despite an increasing need from the sixth inning on. “I was too afraid to go,” he told the Detroit Free Press. Even after Verlander completed his feat, Avila was compelled to take part in the celebration, both on the mound and in the clubhouse. It wasn’t until 10 minutes afterward that he was finally able to hit the head. On the air, Tigers broadcasters Mario Impemba and Rod Allen refused to reference the feat during the game. This is a contentious point, as many in the business feel that a broadcaster’s primary job is to inform the audience about what is going on. Anibal Sanchez vs. Washington, May 8 (broken up in the seventh): Sanchez was over 100 pitches in the seventh, putting Marlins manager Edwin Rodriguez in much the same position as Roenicke. “We were paying a lot of attention to the pitch count,” Rodriguez said in the Miami Herald. Save for Verlander, of course, none of these pitchers was able to finish what he started—developments that had nothing to do with the perpetuation of superstition in their own vigilant dugouts. Then again, it’s not like it would have mattered. “If a pitcher tells you he’s not thinking about it, it’s not true,” said Gallardo in reference to people trying to avoid the subject with him. Which is entirely the point. About the announcers, I think I vaguely recall Remy during Buchholz’ No-no saying something to the tune of, “Well everyone is aware of what’s going on out there.” I don’t think he ever said the words “no-hitter” during the game though, and I remember thinking that was “right” of him. That’s the middle ground — allude to the feat without mentioning it. I don’t have much of a problem with it — color of the game and all that — but I ultimately come down in the camp that says that calling it like you see it is better for the audience.